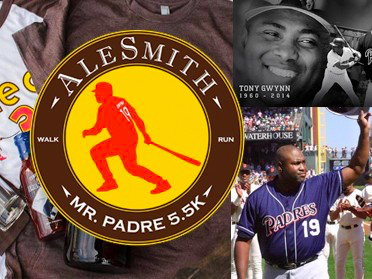 On Saturday, June 20, from 8:45am to 12pm, AleSmith Brewing Company is hosting the first-ever AleSmith Mr. Padre 5.5K, a 5.5 kilometer run/walk to pay tribute to the late hall of famer, Tony Gwynn. Gwynn began his relationship with the AleSmith team in 2014 when they collaborated on the .394 Pale Ale just before his untimely passing. It was then that Mr. Padre expressed his desire to someday have a museum built in his honor – one of his final wishes that AleSmith will carry out. Participants can pre-register for the event on Active.com. Registration fees range from $30-$90, and children under 10-years-old can register for free. Runners/walkers can also register on the day of the event at a booth located at beginning of the route. The 5.5K will begin and end at AleSmith’s new brewing facility on AleSmith Court off of Miramar Road. Funds raised from this event will kick start a campaign to build a Tony Gwynn Museum at AleSmith’s new facility. All proceeds received for the Tony Gwynn Museum will directly benefit the Tony & Alicia Gwynn Foundation. After the 5.5K, there will be a post-party complete with beer, food, live music, a speed pitching booth, a silent auction, family-friendly activities and much more. Alesmith Brewing is located at 9990 AleSmith Court off Miramar Road. For more information, visit alesmith.com/mr-padre-5-5k-2/.